Posted May 18, 2016 by Matthew Dennis & filed under Rewind. The Doctor suddenly finds himself as a contestant on Big Brother, Rose is in a futuristic version of The Weakest Link, and Captain Jack is naked in front of millions of viewers. 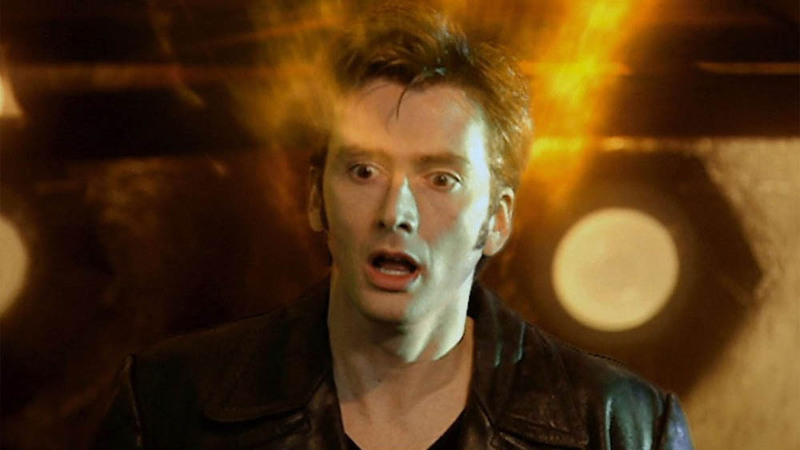 The Doctor and Jack break into the studio where Rose is being held in a bid to rescue her. Rose is apparently vaporised by the Anne-Droid and, for the next ten minutes of the episode, we’re led to believe that she’s actually dead (with the lovely Lynda-with-a-‘y’ seemingly ready to step in as the new companion). The Doctor encounters the ‘god’ of the Daleks – the Dalek Emperor. Marvellous effects work and a great vocal performance by Nicholas Briggs result in a great classic monster reimagining. The Doctor sends a reluctant Rose back home to 2006 in the TARDIS, but not before a hologram of himself tells her to have a fantastic life. The Doctor absorbs the time vortex from Rose and is forced to regenerate into that bloke out of Casanova. “New teeth?” Genius! ‘The Parting of the Ways’ marks the first time on-screen that a Dalek appears inside the TARDIS. It also features the first ever ‘standing up’ regeneration. Jack Harkness’ bum was meant to be seen in full in an alternate scene in ‘Bad Wolf’. Sadly for some and luckily for others the BBC denied fans the chance to see a bit more Barrowman. ‘Bad Wolf’ and ‘The Parting of the Ways’ are an odd yet deliciously brilliant pair of episodes from Christopher Eccleston’s only series of Doctor Who. Part One begins as a funny, tongue-in-cheek romp that seeks to poke fun at modern TV, before slowly morphing into an old school Dalek epic and descending into darkness and death on a massive scale. On paper, it shouldn’t work. In the hands of Russell T. Davies, it’s pure dynamite. Eccleston is never better then here, his final adventure giving him the chance to really let rip with both the sense of humour and the powerful, defiant gravitas that made his Doctor so perfect. Likewise, Billie Piper proves once again what a brilliant companion she can be, as Rose is tested like never before. Davies’ scripts are chock full of hilarious gags, tragic deaths, epic moments, and most of all, a real sense of scale. The stakes have never been higher, the Doctor challenged like never before. And as for that regeneration scene, well… there are no words, aside from amazing, emotional, uplifting, and inspired. 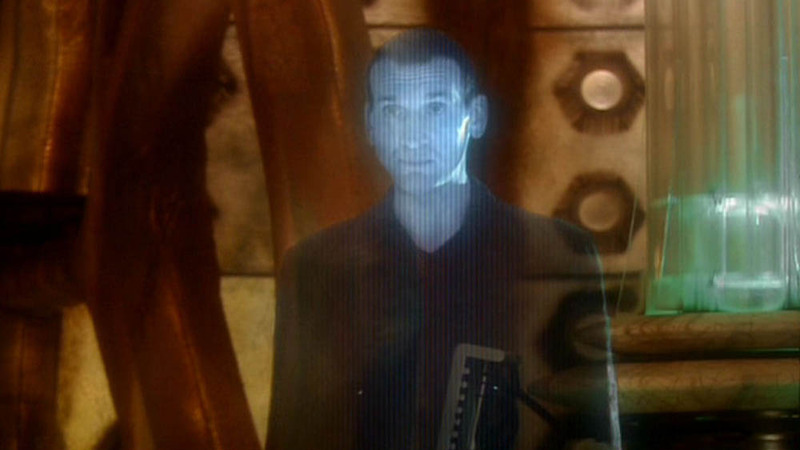 He may have only stuck around for ten stories, but the Ninth Doctor shines throughout all of them. In ‘Bad Wolf’ and ‘The Parting of the Ways’, he shines his brightest. Fantastic! > Buy Christopher Eccleston’s complete series on DVD on Amazon. My heart broke right in the middle of the regeneration; but as soon as he said “And so was I,” I knew he finally started to come to grips about Gallifrey. Who decided that these two episodes were his best? While, I don’t say they were terrible, I’m curious to know the criteria for their choosing. Ten was good, but Nine will always be the best. I love Christopher Eccleston. He was the best. I thought he was really cute and charming. I love his smile. He can smile for me anytime.